When considering security cameras for their home, unfortunately most homeowners have just had a loss on their property: burglary, theft, vandalism or problems with a neighbor. This always upsets me a little bit, because of the fact that means the cameras are coming in too late. Don't get me wrong, it is great to add these security cameras in, I only wish that more people would install them BEFORE something bad happens. 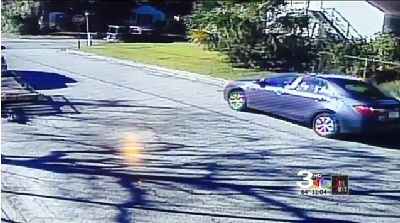 Security cameras come in many shapes and sizes, but even the most basic system can deliver some quality information, as is shown in this current news report about a homeowner in Savannah, GA whose camera has delivered images of a vehicle involved in a drive-by shooting in his neighborhood. This just shows that no matter how safe or friendly your neighborhood may feel, in an instant everything can change. One afternoon, this homeowner found that out for himself, and his security camera system helped provide the police with images of the suspect's vehicle. With families playing outside of their homes on his block, the suspects tore through the neighborhood and sprayed a house with bullets. This is why having a camera system may prove valuable not just for your own property, but in protecting your neighborhood as well. You may never even know all of the lives that might be saved or assisted by the video that your camera system catches. His camera system was a very basic pre-boxed camera system, but still provided some decent evidence. With higher quality cameras, like the newer HD IP cameras, it can even increase the chance of capturing better description of the perps, or even license plates if the camera is well placed. Our newest line of HD home security cameras provide 1080P HD video up to 10 times the quality of traditional CCTV cameras. While this can't guarantee license plates on every car driving up the street, because there are many variables (vehicle speed, angle of travel, positioning of camera, angle of lens, etc) this will go a much longer way in swift justice for those who would dare to cause trouble in your neighborhood. So consider not only the safety of your family and property, but the safety of your entire neighborhood when considering if security cameras are right for your facility. Once you have decided to take the leap and secure your home, now it is important to find a system that will provide the quality level and features that will make your system most useful. Pre-boxed basic security camera systems can deliver a basic view, but most homeowners will rarely use the system for playback because it takes hours to find video. More advanced systems, like our home AVM security camera system allow you to scan through video quickly, making your system very usable and therefore more likely to be used. With advanced archive playback scanning, now you can use your camera system to quickly give you an overview of everything that happened throughout the day in a matter of 15 seconds or less. Many homeowners with this system in place can even identify problems before they happen - people snooping around the front door or yard, children not doing what they say, possibilities are endless. Learn more about our Home AVM Security Camera Systems to help you not only protect your home from theft, but also help protect your entire neighborhood.